One of my favorite things about Dragon Age: Inquisition (and, specifically, about Patrick Weekes's handling of the character of Solas) is the amount of real poetry and nuance you'll encounter in the game's dialogue, especially in Solas's conversations. 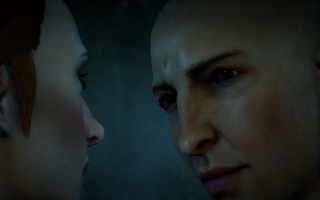 As with so much of the game, there's real complexity and literary skill to be found, and Solas's elegant conversations and banters reveal a depth and empathy that greatly enrich the character who must eventually reveal himself to be our true antagonist, breaking our poor Lavellan's heart (if she romanced him) all over again. one of the most beautiful songs ever written in his responses. 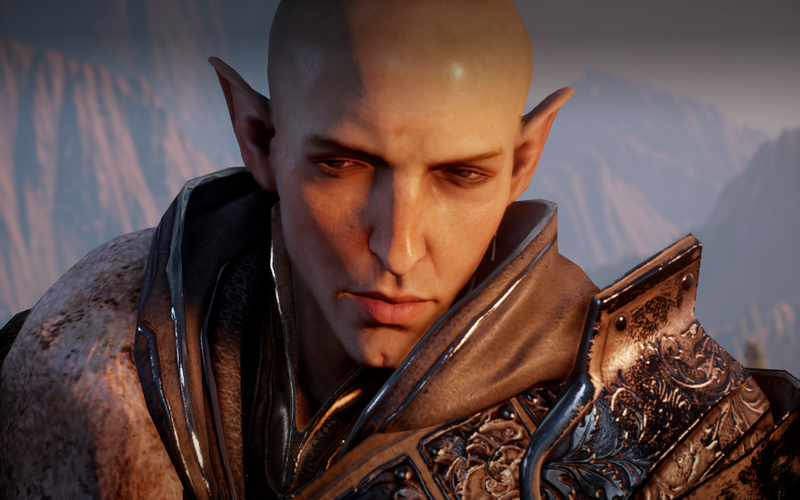 As one of the most complex characters in the game, Solas is a bit of a paradox. He appears to be a precise, rather guarded and cold person at first glance. Yet it quickly becomes apparent that he's a deeply passionate and feeling person, and that he's much more fiery and emotional than he first appeared to be. This is why I'm always telling gamer friends to romance Solas in the game—it's not only the romance most directly tied to the main storyline (and that is gorgeously presented in a way that's practically operatic by the time you reach "Trespasser"—I'd comment more, but I just stopped crying for the fourth time, so I'll skip over it), but it's also the best way to really experience how subtle and rich Solas is as a character, not to mention how playful and beautifully crafted his dialogue can be. For instance, Solas often speaks iambically (with an unstressed syllable followed by a stressed one—essentially, a heartbeat rhythm). Iambic pentameter, most notable in Shakespeare's works, meanwhile, is a string of five iambs (feet) specifically. The best way to remember or recognize iambic pentameter is that it's basically five heartbeats (ba DUM, ba DUM, ba DUM, ba DUM, ba DUM). An easy way for me to remember it is always Shakespeare's "But soft, what light through yonder window breaks?" Written iambically, it can be seen as: "But SOFT what LIGHT through YON-der WIN-dow BREAKS." A good example of Solas delving into iambic pentameter, for example, in "Trespasser," is when Solas says to a romanced Inquisitor, "I want you to know that what we had was real." Or, iambically, "I WANT (you to) KNOW that WHAT we HAD was REAL." Once I stopped crying, I was able to appreciate the underlying subtle poetry of the statement. Barely. But as Corseque points out here, Solas's dialogue goes beyond iambic pentameter and instead reflects something I would argue is ultimately more complex—the rhythms of the classic Leonard Cohen song "Hallelujah." It's a slightly more irregular yet immediately recognizable rhythm. When Solas does this, it's both poetic and lovely that he is almost always talking about the Fade—the dream-world and source of all magic that he loves beyond anything else. His speech in these moments is iambic but it also moves in the song's specific series of rhythms and patterns, and once you recognize them, you may find yourself singing along with his dialogue. I certainly did, and I found it weirdly delightful to do, especially since Gareth David-Lloyd's voice performance as Solas—complete with subtle Welsh accent—is so beautiful that it's already only one step away from being actual music anyway. The origin of the song's effect on Weekes was discussed in a fascinating and revealing blog post by Bioware a few years back, about what music the writers and editors listened to while working on the characters. It's a great article, and the playlist revelations by all of the writers and editors are delightfully true for each of their characters (for instance, yes, I do believe after reading about writer Lukas Kristjanson's playlist, that Sera would totally listen to The Fratellis). In that same post, Patrick Weekes revealed that in addition to listening to a number of movie soundtracks (as a fantasy writer and film-music nerd who writes to them frequently, I highly approve) and lots of Sarah McLachlan songs, that he had also listened to "Hallelujah" heavily while writing certain passages for Solas. Weekes chose the kd lang version, which is lovely, although for me nothing will ever quite touch the raw, stripped-down Jeff Buckley acoustic. Weekes was in fact so affected by the song that he then began to intentionally incorporate its distinctive patterns into Solas's dialogue. And this is where it gets brilliant. I love this—the way the subtext becomes text—plus, as a writer, the fact that it's such a creative way to go with the flow when writing—to actually let something pull you along and into another world. It's an appropriate song choice, given Solas's true identity, as well as his bitterness, pain, isolation and regret, and it also adds another layer of yearning and regretful subtext if applied to a romanced Inquisitor. But that was just the beginning. I loved discovering as I listened to the game's dialogues and banters that Solas so frequently speaks in this poetic and rhythmic cadence, and (best of all), that he actually gives approval if the Inquisitor responds in the same way. And the Inquisitor's not the only one (more on the other appearances of this speech pattern farther down). As noted on tumblr originally by Corseque and Veeeahknee, among others, the cadence and rhythm of the syllables of the song “Hallelujah” can be parsed numerically line by line as "8 / 8 / 11 / 8 / 8 / 11 / 8 / 9," or, iambically, as "4 / 4 / 4 amphibrach 4 / 4 / 4 amphibrach." You already know what an iamb is—the unstressed/stressed "foot." Meanwhile, an amphibrach is typically a stressed or long syllable between two unstressed or shorter syllables. So the amphibraches account for those three extra syllables that close every 12 iambs. and may cause further bouts of weeping or despair. Good times! ing bread as she was ordered every morning. In every loaf she broke the rules. would fold it to the center, like a secret. they called the Shadow Goddess in their stories. I met the spirit that they fled. ern tundra, weeping, lonely, and forgotten. from any of the simple Chasind tribesmen. to come and steal the trinkets still remaining. of almost every land I had discovered. I asked which one it was, the spirit faltered. word for what I was." no longer sheltered by the stone. An earthquake had exposed it all to daylight. 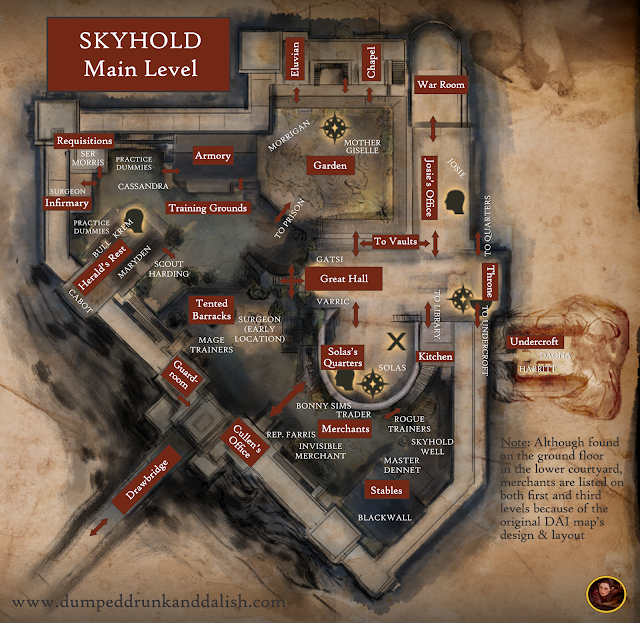 their last stand marked by one great ring of armor. to a small stuffed toy. against the sun, the first time he had seen it. The tears were streaming from his eyes. until I saw the rock he held so tightly. to seal the rifts. I tried and failed. No ordinary magic would affect them. It seems you hold the key to our salvation. felt the whole world change. ied deep beneath a dead and barren wasteland. Volcanic ash had sealed it tight. ing creature in the city seared and smothered. as love first blossomed in their adolescence. who would return their love with gentle kindness. go marching toward the battlefront. They sang a soldier’s hymn to keep formation. The primal music shook the ground. ried harmonies no Chantry choir has mastered. Where it gets truly interesting is that Solas isn't the only one "singing" to "Hallelujah." Others will respond in kind when moved to reflect his spirit or mood. Cole, for instance, speaks in the "Hallelujah" cadence too, when Solas, grieving over the loss of his friend, a spirit of Wisdom, specifically asks him to remember her as he himself would. Solas: (Sighing) Could you... if you would remember her, could you do it as I would? to walk without a care in search of wisdom. unseen for ages, now beheld in wonder. 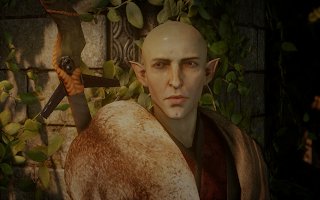 Solas (visibly moved) thanks him, and is silent. I now must walk in solitude forever. my, much less someone that I once cared for. As Cole is probably the one companion Solas is closest to in the story (aside from a romanced or high-approval Inquisitor, it's appropriate and moving that Cole would both reflect and serve as a conduit for Solas's words. These instances are all the richer because Weekes, as the writer for both Solas and Cole (as well as The Iron Bull), was able to weave the patterns into their dialogues in a seamless way. in so doing, do all a great disservice. Is there a way to coexist? at least without such active confrontation? Not in the world we know today. that makes true understanding most unlikely. that you thought to ask. Meanwhile, Solas isn't done singing. He notably repeats the pattern again several times in the emotional final conversation in "Trespasser:"
I broke the chains of all who wished to join me. their world." All to the cadence of "Hallelujah." Thanks, Solas! Seriously, Dread Wolf, kill me now. Or, no, wait, call me! I woke still weak a year before I joined you. but still some hope remains for restoration. means this world must die. her sadly from across an endless distance. she reached for him, he vanished into nothing. So are you singing the song yet? I've been singing it while writing this entire post (in between weeping bouts). And have I missed any other appearances of the pattern? Please do share your thoughts in the comments!